Visitors. . . and a Story | OccasionalPiece--Quilt! Posted on February 16, 2010 by Elizabeth E.
We had some visitors from out of town last week. 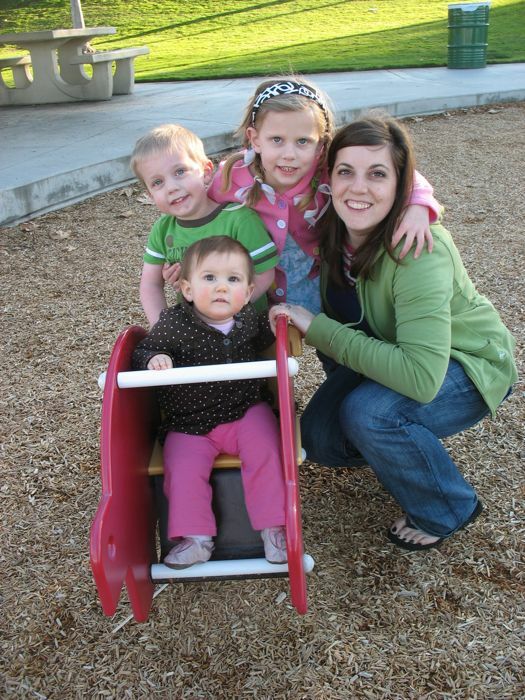 It was my daughter Barbara and her three kids: Cute, Cute and Cute. Did I mention that they were cute? All my grandchildren are cute. I’m so very lucky. 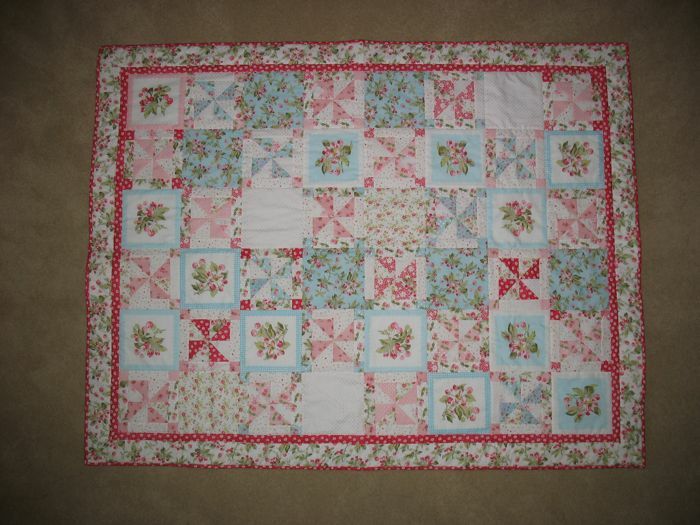 Some time ago, I’d made a quilt with pinks and blues and cherries and flowers and was so frugal with my fabric I had enough for another quilt leftover. I starting piecing the pinwheels and put them up on the pin wall, and then was stuck. I tried this combo and that combo and nothing would come together. 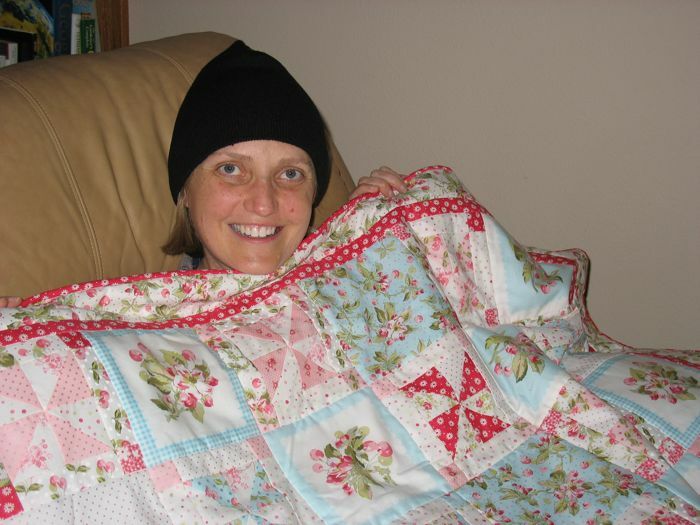 Then one horrid horrid day, our friend Heather wrote to say that she had Stage IV metastatic breast cancer, and it had spread to her liver, and maybe her brain but they were doing CT scans checking, checking. We waited. Good news! No brain mets, as she said. I began to work again on the stuck quilt. Only I knew now it was for Heather so it flew together in a glorious explosion of work and love and tears and care for our friend. I thought long and hard about what to name it. I arranged a visit to see her shortly before she would begin her first of six rounds of chemotherapy, a grueling process. I wanted her to have the quilt. I had in my mind what I wanted to call it, carrying along my pen to sign and write the name on the back, just in case I was right. I told her that it meant to me that because of her suffering she would see and understand so much more about heaven and earth than she ever would before. She would see that indeed, earth is crammed with heaven. I tracked her chemo treatments on my calendar, trying to visit when possible, emailing whenever as I waited for her to come up out of the vortex of chemo and bendy bones and pain. Oh, yeah. You go, Heather! Happy Valentine’s Day. Happy Chinese New Year.